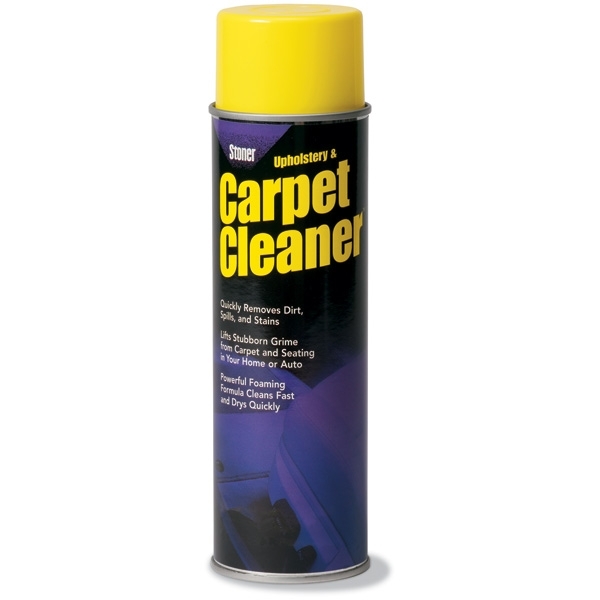 Stoner Carpet Cleaner - 18 oz. Stoner Upholstery and Carpet Cleaner 18 oz. Aerosol Can removes water-soluble dirt, spills, stains, and grime without leaving saturated, wet spots. Its controlled spray system evenly distributes heavy cleaning foam without leaving a large amount of foam to spread. The product is Versatile enough to clean quickly, removing tough dirt, spills and stains without adding water. Stoner Upholstery and Carpet Cleaner dries fast with great results Just try it for yourself Upholstery and Carpet Cleaner is so simple and easy-to-use, just spray and wipe to lift tough dirt Carpet Cleaner's powerful and fast acting foam dissolves and loosens dried-on food stains, spills, blood, and oily dirt. This water-based cleaner is hard on dirt yet virtually harmless to carpeting, upholstery, and other surfaces. It leaves no sticky film or residue.